In our last blog we chatted about the popularity of Incline Village and how the value of living in and around our family-focused community is boosting real estate sales and overall appeal. Paralleling this trend is the revival and remodel of some of the town’s favorite restaurants and new establishments to add to our epicurean delights. What used to be Tomaato’s restaurant in the Country Club Mall area, is now FUMO. The change is part of what the owners call an “evolution process.” They will keep the more popular items from their former menu that pretty much specialized in delicious pizza and pasta and open for breakfast – which is a welcome addition to our community. Their website details what you can expect when you visit FUMO’s this year. When the weather is our favor, we love to take our pups to the Patio just outside the restaurant where the owners are very ‘pet friendly.” You can also order from their menu on line with delivery service available from 5:00 p.m. – 9:00 p.m.
You can take a peek at their full menu by visiting their website at Fumotahoe.com. One of the best places to hang-out and sip on some locally-made brews is the ever-popular Alibi Ale Works in Incline Village. Last year they were thinking about opening another brewery in South Lake Tahoe and/or Reno. However, another one of Incline’s icons “Hacienda de la Sierra” decided to call it history – which left an open spot for another restaurant to move into town. In a recent article, co-owner Rich Romo noted: "It wasn't something we were like gunning for and then it popped up and we were like 'well this is about as good an opportunity as we're going to get in Incline to do this.'" When all was said and done, the owners at Alibi purchased the former Mexican restaurant and jumped into an extensive renovation with plans to open the Alibi Ale Works Public House” – much like their popular restaurant in Truckee, CA, this spring if all goes as planned. Romo continued to explain: "That's kind of the point of a public house … engage people, engage in conversation." The new location also will resemble the Truckee location in appearance: Romo plans to employ the same look and concepts in the interior design. The space will require substantial renovations, somewhere on the order of approximately $650,000 according to Romo. Promoted as “Incline’s Best New Burger Spot,” Inclined Burger and Brews has taken the top spot for a great burger and cold brew. It’s located right next to the Incline Cinema and although the menu is limited (which has turned out to be a bonus), the food is fresh, fast, and delicious. 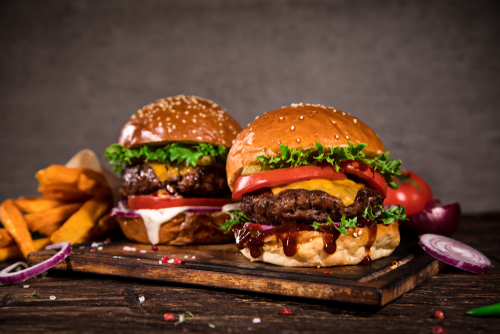 There are three burger options that include a single, double, and veggie – with a children’s menu as well. Owners Mike Penning and Scott Beck attribute their immediate success to its use of their locally-sourced sirloin from Sierra Meat Company. "The uniqueness is probably the cuts of meat that go in. We use sirloin, chuck and short rib … and we ball them by hand. There are no pre-formed patties," explained Penning. “The burger balls are smashed on the griddle and topped with raw onions that begin to caramelize and flavor the meat. A flip of the burger gets the onions directly on the heat, creating the flavor and texture indicative of the Oklahoma-style fried onion burger. Be sure to get a side of their Garlic Fries which Penning notes are “on-par with the fries at AT&T Park." You can see a list of the menu items right here. There’s also a good selection of brews, wine, and for those who always order their burger with a good-old-fashioned milk shake, this is your new hot spot!